What a beautiful morning! I mix up my coffee/Nido/Boost breakfast drink and eat dried cherries and granola bars as I pack up a nice, dry tent. What a contrast from yesterday. I make a last check for gear and tiny bits of trash before putting on my pack and beginning the climb towards the Divide. 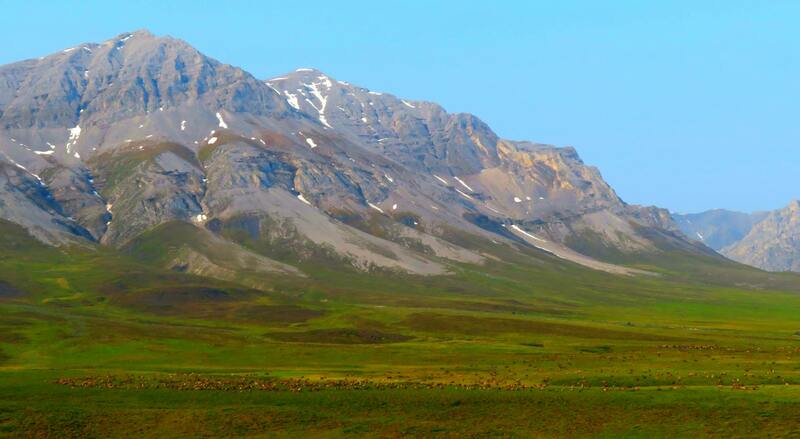 Soon I’m surprised to see antlers moving on the plateau across the creek. I’d thought I’d seen my last caribou. 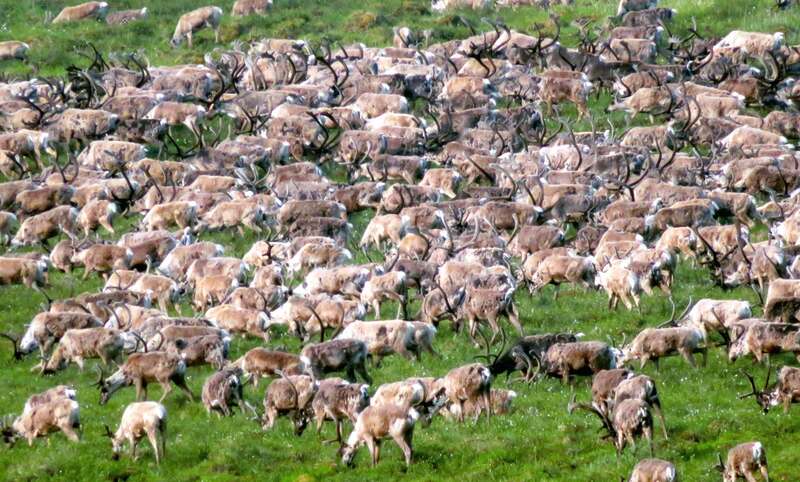 I climb the hillside and the scene unfolds: caribou, thousands of them! 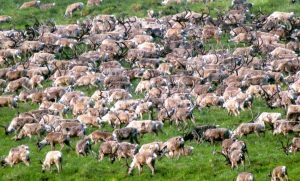 The leaders graze while a smaller group flows across the tundra in a fast trot, on their way to join the main herd. I sit down and put my camera on its tripod and begin to take photos. It’s fascinating. The herd is like a single organism, an enormous amoeba, changing shape. It is mostly bulls, with no discernible leader, yet the herd somehow has a plan. It is impossible to capture them all in one photo, they are scattered over a mile or two. There must be… four or five thousand in all. The single biggest herd I’ve seen. It is absolutely thrilling. Eventually the herd flows away from me, up a mountainside, and heads off into the distance. I sit for while, watching them go, feeling as if I’ve just reached the end of the greatest movie I’ve ever seen. I put away my camera and tripod and resume the climb to the continental divide. Occasionally there are moose or caribou skulls, complete with antlers. 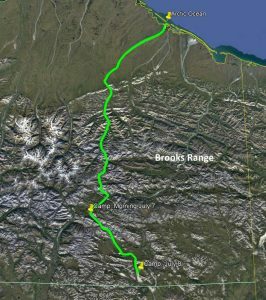 When I reach a gorge I leave the creek and try to pick the easiest route, avoiding tussocks as much as I can, looking for firm tundra to walk on. The pass I’m headed for is not as obvious as it might seem. The creek I’m following branches out and I have to be careful to choose the right one. It’s just before noon. I recognize the pass ahead, the one I identified months ago. At last I stand on the continental divide between the Kongakut River and the Coleen River. Behind me the water flowed into the Arctic Ocean, ahead it flows into the Pacific. 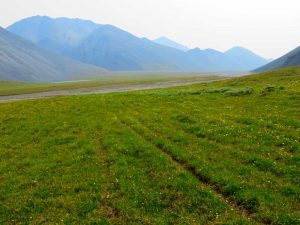 It’s a long slog over a marshy plateau before I reach a mostly dry creek bed which I follow for a couple of miles down towards the Coleen. 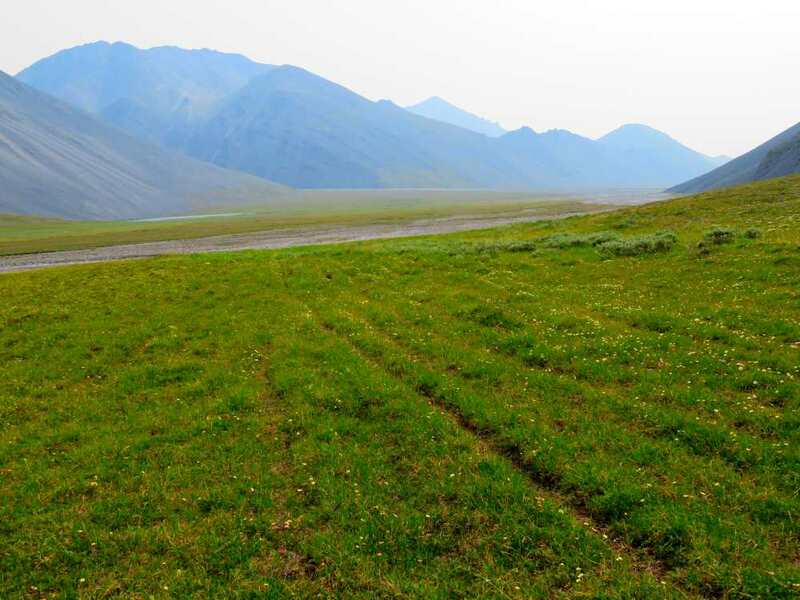 Caribou trails lead out into a wide river valley, green and gray and sprinkled with yellow wildflowers. I’m surprised to find the channel to be completely dry. There isn’t an animal in sight. It feels both wild and lonely. In fact, one study found the most remote spot in the mainland United States, the spot farthest from any village, road or trail, is here, at the headwaters of the Coleen. 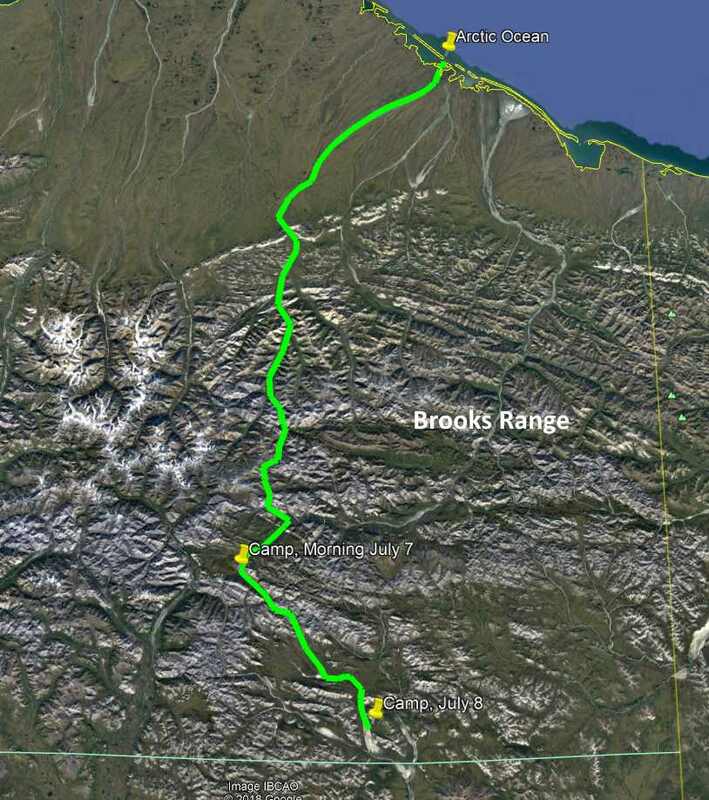 For Alaska, this is crazy easy walking, along mostly firm tundra and gravel bars of a dry riverbed, so dry that there is no water to refill my canteens. After several miles I spot a pool of cold, clear water. It feels wonderful to sit down after many miles to fill my water bottles and get something to eat. It’s about 6 PM. 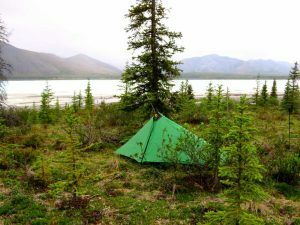 There’s a perfect little campsite among the willows, on dry tundra, a stone’s throw from the now flowing river. I decide to camp here, a little early. I set up my tent and hang my sweaty socks on some willows to dry. There are fresh moose tracks nearby. I bet I see the first moose tomorrow. It’s warm. There are a few skeets around. Faint gray drift smoke from distant wildfires hangs in the valley. Of course, the sun didn’t even set last night, here in the Arctic summer, but I’m happy to awake to a clear day and a warm sun. My socks have dried, life is good. I haven’t walked far when I’m startled to see a large animal crashing through the willows. Moose! A young bull. 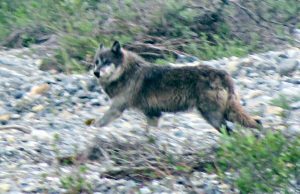 He trots out of the willows and over the tundra, disappearing over a low ridge. The sunny day is turning cloudy. From the nearby willows comes a clucking sound, then a flock of white and brown ptarmigan explode into the air. I soon flush some of them again. And then another flock and another flock. Very fun! I see a cow moose, then another bull moose and lots more ptarmigan suddenly flushing out of the willows. This would be stressful day if I expected every startling event to be a charging grizzly. It sprinkles off and on. I watch the sky, trying to guess if I should put on my rain jacket. The willows are getting taller. Ahead, I spot the first spruce tree of the trip. Something is loping through the willows ahead. I manage to get my camera out as it runs out onto the gravel bar and across the river. A wolf! It’s a beautiful color phase, brown dappled into it’s gray coat. Cool! There are more and more spruce, and they are taller now. The river winds through trees and tall willows and the walking becomes much more difficult. I try hiking up on the mountainside but that’s slow going as well. I drop back down to the river and find some easier gravel bars. I build a small fire on the gravel bar and cook lunch. Firewood is abundant now. I burn the fire away to ash for the next high water to wash away. The trees thin and I’m surprised to find a wide river of aufeis stretching for miles into the distance. I clamber up on top and follow it down the river valley. 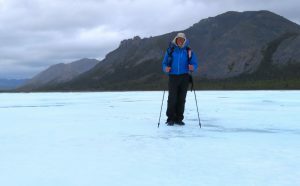 There are shallow pools of icy water, and channels to negotiate around, yet overall it’s easy going. This sure feels remote. My campsite last night felt warm and friendly. This area does not. But it is very wild and beautiful in it’s own way. Late in the day I start looking for a campsite but the aufeis meets a spongy hillside. 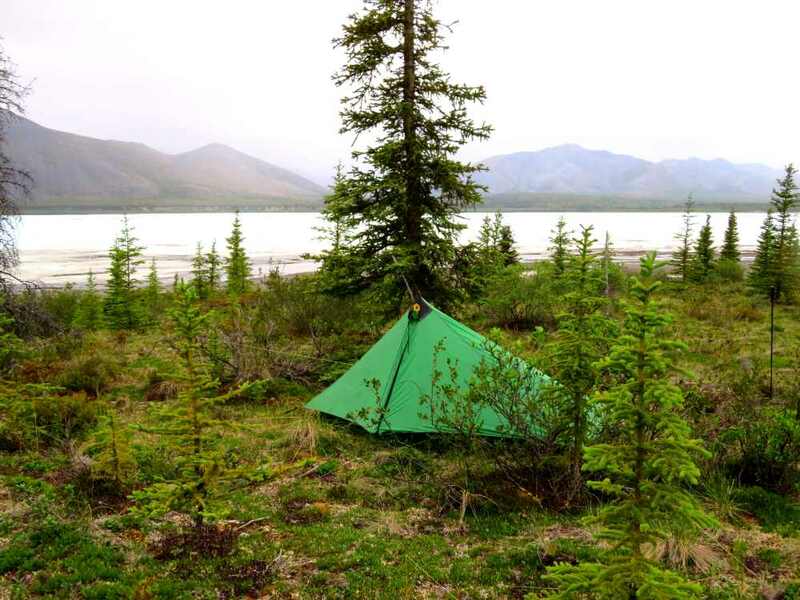 I explore a flatter looking area and at last find a good spot well off the river where I set up my camp. After walking on wet ice for hours it feels nice to put on dry socks. Tomorrow I’ll make it to my first cache, and my boat. I’ve come a long way from the Arctic Ocean. Great writing Buck. The stark beauty of the wild kinda makes you wonder why the hordes don’t go up there doing what your’re doing. Made my 500th jump up on the Coleen River. Every cast in that stream pulled in record sized grayling!